38 - $128.99 Only 2 left! 40 - $128.99 Only 5 left! 42 - $128.99 Only 3 left! 44 - $128.99 Only 4 left! 46 - $128.99 Only 6 left! 48 - $128.99 Only 5 left! So Halloween is right around the corner, and you are a huge fan of both zombies and looking stylish. Now how could one possibly pull off a combination of the two? Well, it’s easy to look like the classiest survivor of the zombie apocalypse with this Men’s OppoSuits Zombiac Suit! 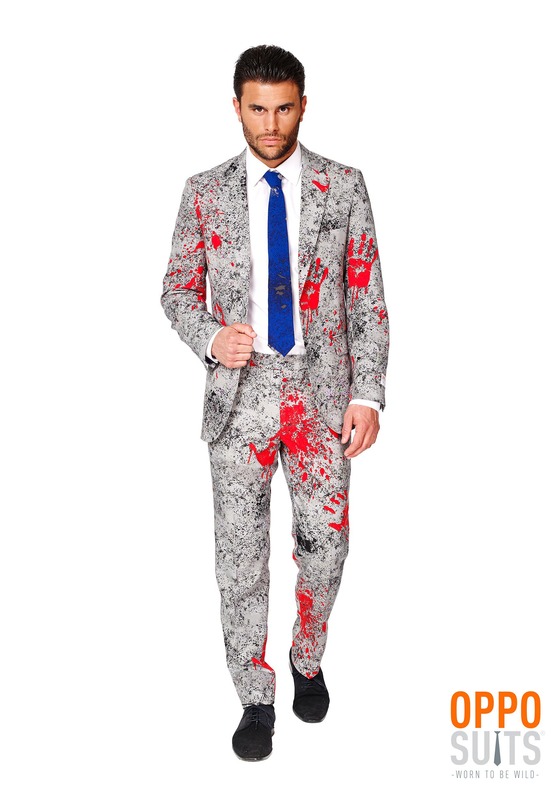 Once you toss on this two-piece suit it will look as if you’ve spent the past few weeks slaying your way through hordes of zombies. 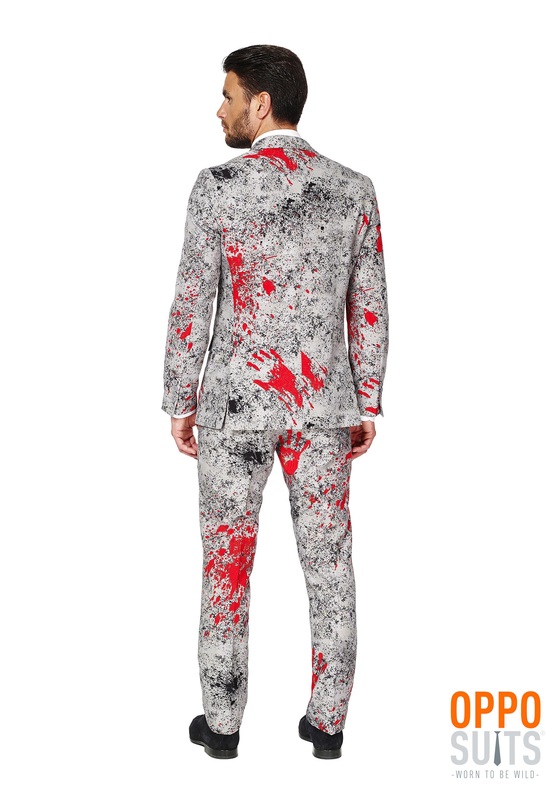 With the bloody handprints that cover this suit, people will know that you’ve had a handful of close encounters with the living dead. However, when they look closely they’ll also notice that besides a few blood and dirt stains your suit is still in tip-top condition. No zombie has ever been able to tear a single thread of your awesome attire. When you go out for Halloween wearing this Zombiac Suit everyone will know that you are the classiest survivalist to ever make it through an apocalypse. You can tell everyone that it was a walk through the park compared to a day at the office. Make sure you pause for the laughter, because when done right that joke is a crowd killer! Get your hands on some accessories to really take this outfit to the next level. A pair of our black tux shoes will certainly class up your look a bit, and the better you look, the better you feel, and therefore the longer you survive. Oh, and awesome apocalyptic weapons are a must have! So, we suggest a brutal baseball bat or a steely katana paired with an automatic shotgun or a .44 magnum. Yeah, with that weaponry and this fantastic suit, there won’t be a zombie in the world that has the stomach to go up against you.